Thank God for the CARIFTA Games! They are scheduled to be held in Montego Bay, Jamaica over the Easter weekend, and are coming at a time when our Caribbean integration movement seems to have descended into a phase of extreme inertia, irresolution and lack of vision. For those committed Caribbean integrationists who have endured the psychic pain associated with the “Shanique Myrie affair”, the deliberate sabotaging of the Caribbean Court of Justice, the scandalous failure of CARICOM to appoint a new Secretary-General, the harsh and unfriendly policies of the new Barbados government towards Caribbean immigrants, and the several arrogant anti-integrationist mouthings of the new Trinidadian Prime Minister, the beckoning spectacle of the 40th edition of the CARIFTA Games is a welcome relief! In less than two weeks time, hundreds of the best and most accomplished Caribbean young people will converge on Jamaica from virtually every corner of the region in order to put on a showcase of the unsurpassed strength and vitality of our Caribbean Civilization in the sphere of Athletics. 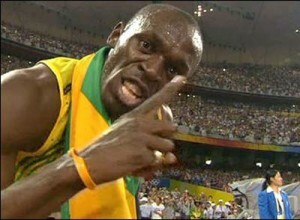 Usain Bolt at the Beijing Olympics. And we do not use the word “unsurpassed” lightly! No less an authority than the President of the International Athletics Association Federation (IAAF) – Mr Lamine Diack – has rated the CARIFTA Games as being on par with any other international Track and Field competition, and as being the best developmental meet in world athletics. Indeed, the CARIFTA Games have produced such world famous athletes as Usain Bolt, Veronica Campbell – Brown, Debbie Fergueson, Kim Collins, Obadele Thompson and Pauline Davis-Thompson, to name but a few. If prime ministers Golding, Persad-Bissessar, Stuart, Spencer, Douglas, King and Ingraham are being assailed by negative doubts about the worth and viability of the great regional enterprise that our forefathers embarked upon with the launching of CARIFTA in 1967 and CARICOM in 1973, then they need look no further than the CARIFTA Games for reassurance and confirmation that regional unity offers us the best prospect for developing and unleashing our undoubted potential and making our way in the world. Indeed, the current Barbadian Minister of Health who is so lacking in a Caribbean vision that he recently decreed Barbados’ public health facilities to be off limits to Caribbean nationals who are legally working and paying taxes in Barbados, needs to be reminded that the originator of the CARIFTA Games is the outstanding Barbadian sports administrator, Austin Sealy! Mr Sealy, obviously inspired by the great regionalist dream of Barbados’ Errol Barrow, Guyana’s Forbes Burnham, Antigua’s Vere Bird, Jamaica’s Michael Manley and Trinidad’s Eric Williams, made his own unique contribution to the unfolding Caribbean edifice with the conceptualization and launching of the CARIFTA Games in 1972, thereby doing for sport what CARIFESTA was intended to do for the Arts. And so, we would like to encourage the entire region to turn its eyes to Jamaica over the course of the Easter weekend! We would also like to encourage every single Caribbean government to ensure that their citizens are afforded full and free live television coverage of this most important annual exercise in Caribbean self expression, integration and achievement. The young athletes of our family of Caribbean nations are coming together to engage each other in fierce but mutually respectful competition. Over the three days of the CARIFTA Games they will make new inter-regional friendships and learn more about the variegated culture of our Caribbean Civilization. And collectively, they will lay a foundation for future Caribbean athletic achievement on the world stage. These young citizens of the Caribbean will be teaching valuable lessons that your politicians desperately need to heed and follow! From 1973 to the present day , the Caribbean has not been short of sporting excellence but yet regionalism is still just an illusory goal. No matter what great things might take place at the Carifta games it will contribute very little to regional unity. Recent history does not show otherwise.